You may know me as the dog with all the wrinkles. You should know, though, that puppies have more wrinkles than grown dogs. In other words, we sort of grow into our skin! We used to be called the Chinese Fighting Dogs, since we were originally bred to fight for our gambling owners, and we still maintain a tenacious, if not pugnacious attitude toward other animals. We are very devoted and loving to our humans, though. That can be good and that can be bad, depending upon what you are looking for. An unusual feature that we share with the Chow Chow and the polar bear is our blue-black tongue. Shar-Pei puppies are irresistable in appearance, but we're not the ideal pet for eveyone. I will need to have space to play and exercise, even though I also enjoy being in the house. When fully grown, I am between 18 and 20 inches tall (45.7 to 50.8 centimeters) and I weigh between 35 and 45 pounds (15.8 to 20.3 kilograms). We have no Chinese Shar-Pei Breeders listed at this time. 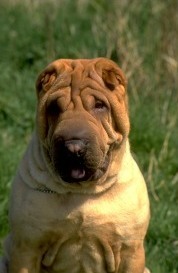 Click here to place your Chinese Shar-Pei Ad!